It’s been ten years since the first post. We don’t have the time this year to stage a commemorative photo realization. We have a bus to catch so we can cover the KXL protest march in Lincoln, Nebraska later today. The content beast is ever present. Happy birthday to us! Our first post on August 6, 2007 (left) and our latest post (right). It’s been nine years since Show Me Progress came to life. Well, okay, nine years and a few days. We almost forgot. That tends to happen with anniversaries during a presidential election year. As near as we can tell (through two platforms) that’s 10,855 posts, give or take a few, and 1,806,921 page views over those nine years. And we’re still here. We started at this blogtopia (y, sctp!) thing three years ago. And, yes, we’re still here. 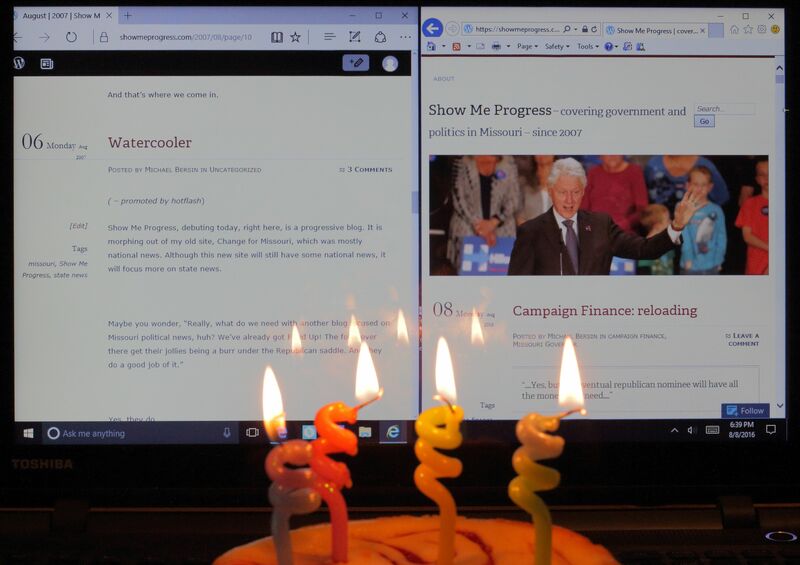 A photo of candles and cake as an illustration of our celebration at reaching another milestone is becoming a tradition here at Show Me Progress corporate headquarters. Actually, it’s just an excuse to get the cake and eat it after the photo shoot – along with the ice cream thawing off camera.